Back before digital, I carried stacks of cassette tapes or CDs, even a boom box once, so I could listen to music when I traveled. Now that the digital age is here, the cassettes and CDs have been replaced by mp3s and an iPod (or two). Something, however, is still missing. I couldn’t carry my entire record collection with me then, and I have more than 80 gigs of music now, so no matter what I’d leave music home. Inevitably I’d want to listen to a Miles Davis disk from the ’70s and not one from the ’50s that I brought with me. If you use iTunes to manage your digital music, it’s now possible to have your entire collection — every scrap of music in your Library — available to you or your designated friends using a simple application known as Simplify Media. I downloaded a small 4 mb install file to my laptop, loaded the program, created an account, and was up and running in a few minutes. I used the Invite button, sent my daughter an email from Simplify Media, and she used the subsequent link to download the program and install it on her laptop. I didn’t need to change firewall settings, which is always a good thing. I designated a folder on my hard drive for Simply Media to find the music I want to share. No need to import music from iTunes. My daughter did the same thing on her computer. I opened up iTunes and along the left side, under Shared, I found my library; it was also available to my daughter on her computer. I played a Pink song from her collection, and she played the latest White Stripes from mine. Common file types, such as mp3, aac, and wma, can be played but not DRM-protected wma files, vorbis, or lossless formats like wav or flac. I can play songs purchased from the iTunes Music Store, which are DRM protected, but I had to log into Simply Media using the same user name and password on both computers. If my daughter and I logged in using separate user names and passwords, we could still see each other’s libraries but have access only to non-DRM files. 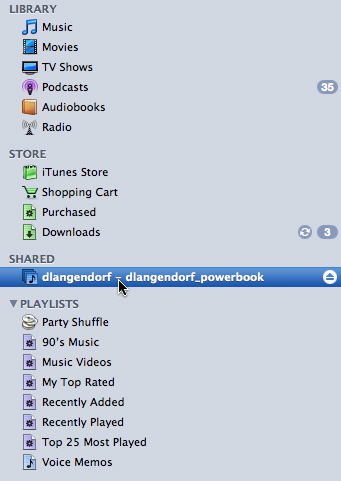 Also, you will need to enable Look for Shared Libraries in iTunes preferences. I left the house for a bit, and both Macs went to sleep. Upon returning, I fired up my laptop and looked for something to listen to in her library. Clicking on a song woke up her computer, although it took a minute or two to get the sleep out of its eyes before it started playing. Obviously, the remote computer will have to be on, or sleeping, for Simplify Media to work. The same sort of thing can be achieved with Hamachi. You use this to create a simple VPN between two or more computers and, using iTunes sharing feature, you can access other VPN members’ tunes easily! Its what me and my wife do while I’m at work (I have the much larger library). There are definitely other ways of streaming your iTunes collection over the web. However, we found that Simplify Media made it particularly simple to do. So it’s a nice alternative to other methods.